An overview of the plenary meeting room during the Senior Arctic Officials’ meeting in Juneau. As Senior Arctic Officials met in Juneau last week, trepidations about U.S. President Donald Trump’s policy engagement in the region and anxieties of address black carbon pollution ran high. 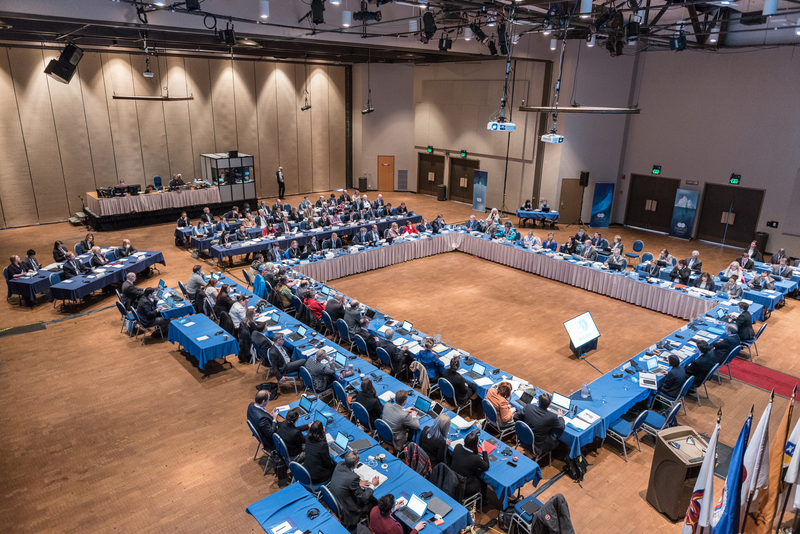 Last week, Senior Arctic Officials convened in Juneau, Alaska for their last full meeting to prepare for the Arctic Council Ministerial Meeting, which will take place on May 11 in Fairbanks. The meeting, comprised of roughly 180 attendees from all eight Arctic states, six Indigenous Peoples groups, and 32 observers, focused on reviewing, considering, and approving work of the subsidiary bodies and working groups to present to the ministers in May. One of those tasks still on the to-do list is the mitigation of black carbon emissions — a key focus for the meeting last week. “It’s a big problem,” Balton noted to the crowd. “It’s also a problem that is not solely caused by countries in the Arctic region” and ultimately not up to the Arctic to decide a ban on black carbon or heavy fuel oil, a key source of the pollutant. Black carbon, a fine soot that falls on snow and ice, absorbs more UV sun rays and quickening melting. While cleaning up black carbon has been identified as an easy and quick way to slow the retreat of Arctic sea ice, a gap has formed between research and political action. At the meeting, Senior Arctic Officials worked with observer countries and organizations worldwide to address the contaminant, most notably with attendee Kitack Lim, Secretary-General of the International Maritime Organization. Lim delivered a speech on the environmental protection and seafarer safety features of the Polar Code, an international code of safety for ships operating in polar waters that came into effect at the start of 2017. When asked if the Arctic Council will consider further action the use of heavy fuel oil and consequential black carbon emissions in the Arctic, Balton doubted further direct action by the Arctic Council and instead pointed to the “symbiotic relationship” between the Protection of the Arctic Marine Environment, PAME, Working Group of the Arctic Council and the IMO to inform one another on future decision making. The Snow Water Ice and Permafrost Report from the Arctic Monitoring and Assessment Program and further research into the increase in ocean acidity were also discussed at the Juneau meeting, but progress on both will not be made public until the Ministerial Meeting in May. Beyond climate change and pollution in the Arctic, the question on everyone’s mind parallels the dominant news headlines of the time: how will President Trump and his administration’s policies affect the Arctic Council and region more generally. Balton quickly dispelled speculations that the first Trump-Putin meeting would take place during the Fairbanks Ministerial Meeting. The Senior Arctic Officials have recommended to U.S. Secretary of State Rex Tillerson that he attend the Ministerial in May, as he is the current Chair of the Arctic Council. “We don’t have decisions yet, Secretaries of State are busy people,” Balton reminded those at the Press Conference, “So stay tuned on that.” The last three times the Arctic Council met at the Ministerial level, U.S. Secretaries have attended, and it is expected that Tillerson will follow this tradition. As to the wider workings of the Arctic Council, Balton did not expect US participation in the body to be affected by a Trump presidency, noting that the needs of the Alaska and the desire to keep the Arctic a peaceful and stable place are both nonpartisan issues and guiding principles of U.S. Arctic policy. In his 20 years of service in the federal government specific to the region, Balton has not seen significant change in America’s interests and goals in the region and does not expect them to change now. Discussions of what a Trump presidency means for the Arctic Council and the upcoming transition of the Chairmanship to Finland bring up a wider challenge of a body whose leader changes every year: continuity. To ameliorate the challenges that that come with continual change, the Arctic Council has embarked on creating a Long Term Strategic Plan for the next ten years, to be delivered to the Ministers in 2019. The Council as a whole has never done a strategic plan for more than two year increments, and this endeavor is an important step for the future sustainability of the organization. The beginnings of the Strategic Plan will officially launch at the Ministerial Meeting and be one of the key outputs of the Finnish Chairmanship, along with their focus on the Paris Agreement and Sustainable Development Goals. As the Chairmanship moves to Europe for the next decade, the Unites States is looking to make the impacts of its initiatives as Chair last longer than its two year agenda. The Long Term Strategic Plan and Finland’s focus on climate-oriented themes may do just that.